Joplin And Nearby Areas Warned Of 'Intense Tornado Outbreak' Today : The Two-Way Already struggling to recover from Sunday's devastating tornado that killed more than 100 people, residents of Joplin, Mo., have more severe weather to worry about later today. 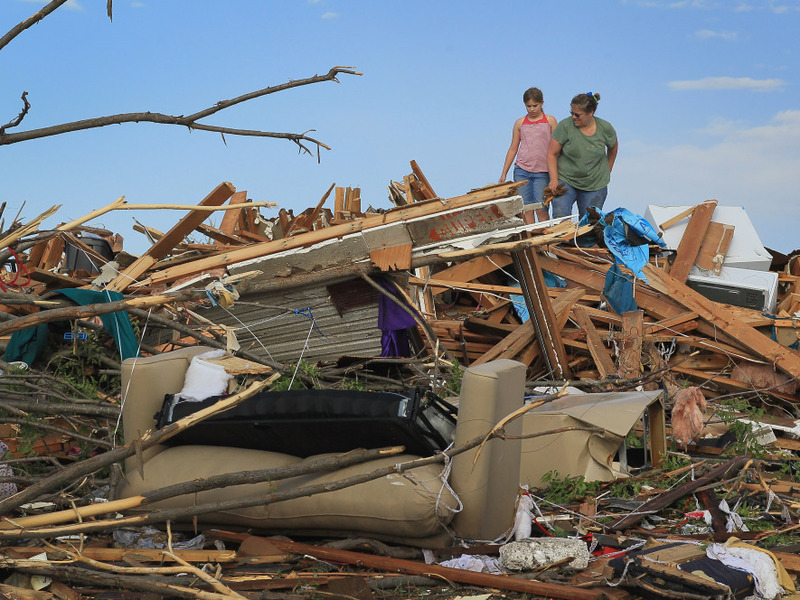 Nine-year-old Maddie Meek (L) and her mother Dina Meek salvaged what they could from a relative's home in Joplin earlier today (May 24, 2011). Already struggling to recover from Sunday's devastating tornado that killed more than 100 people, residents of Joplin, Mo., have more severe weather to worry about later today. "Intense tornado outbreak expected over parts of the Southern and Central Plains and Ozarks this afternoon through early Wednesday. "The NWS Storm Prediction Center in Norman, Okla., is forecasting the development of a few strong/violent tornadoes ... very large hail ... and damaging winds over parts of the Southern and Central Plains and Ozarks this afternoon and tonight. -- Western and Northern Arkansas. -- Central and Eastern Kansas. -- Western and Southern Missouri. -- Central and Eastern Oklahoma.